On Sunday, Tina and I saw that McDonald's had a new sandwich - the Southern Style Chicken. The photograph made it look like a spicy (we mistook the pickle to be a jalapeno) version of the McChicken, so we passed on it and picked up some Chicken McNuggets. Yesterday, while watching television I thought I saw (or rather heard, since I was working on the computer) a commercial for the new sandwich announcing that on May 15th you could try the sandwich for free. So, I went to McDonald's for lunch today. After confirming that the sandwich was free, I ordered one as well as a 32 oz. Sweet Tea for $1 that I saw a big sign for outside. I haven't had their sweet tea yet, so I thought it would be fitting to try it with the Southern Style Sandwich. This was fortunate since you only get the sandwich for free if you buy a large beverage. So, $1.08 (8 cents of tax) netted me a sandwich and beverage. The sandwich looks like it's on the same sponge bun that a Filet o'Fish comes on (which is good, I like the soft, slightly sweet bun). 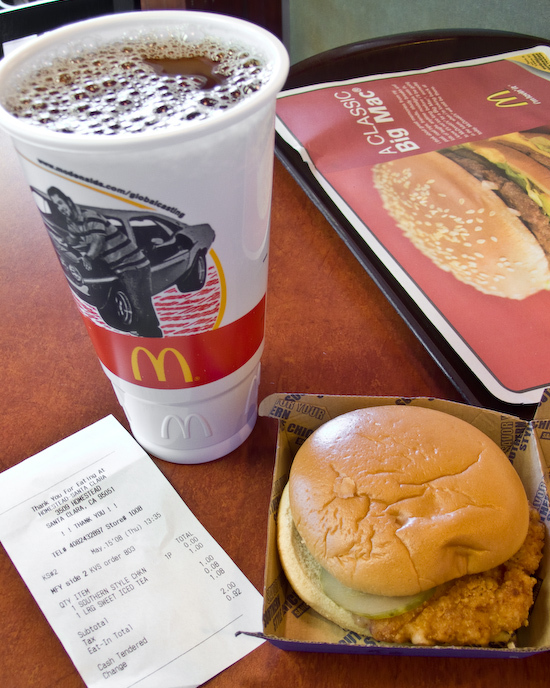 The breaded and fried chicken breast patty is thicker than that of the McChicken, but otherwise it looks quite similar. The regular price of the McChicken is $1 while the price of the new Southern Style Chicken sandwich is somewhere around $2.50 normally. In addition, the McChicken comes with a decent amount of shredded lettuce (gives it a nice crisp crunch) as well as a decent dollop of mayonnaise. The Southern Style Chicken surprisingly seems plainer than the McChicken. I opened up the bun to take a look "under the hood" and was even more surprised that it really was just a patty and two pickle slices! I sighed as I took a sip of my sweet tea (which was initially shockingly sweet like all properly brewed sweet tea should be to a Californian) and picked up my sandwich to eat what would probably taste like it cost $1.08. Boy was I surprised. Perhaps it was aided by my low expectations. The chicken breast was incredibly tender for chicken prepared by McDonald's - not at all like a McChicken's patty. It reminded me of a juicy fried chicken strip from KFC when it's been properly done (recently out of the fryer and not sitting around drying out under heat lamps). It was flavorful and mildly spiced. I didn't actually miss the lack of toppings, it was tasty without them. Would I have it again? Probably - I'd be curious to see if it tasted as good the second time around. The sweet tea was also pretty good reminding me of what sweet tea tasted like from Texas and South Carolina. Definitely doesn't taste like sweetened ice tea in California. I've got to figure out what makes sweet tea taste different - maybe it's dissolving the sugar while brewing and using a lot of it. I also suspect that they might be using real sugar in sweet tea instead of HFCS, but I can't be entirely sure. Ingredients for sweet tea aren't available online yet and I called their customer service number too late (they close at 5pm Pacific time which was a couple minutes before I called). 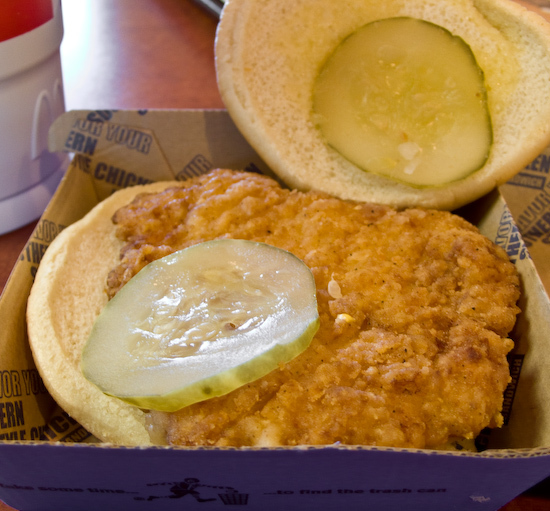 The two pickle slices make it pretty obvious that it was not anything from KFC that McDonald's had in mind when they made this sandwich, but rather the flagship sandwich from Chick-Fil-A. I'll have to try it as I'm curious to know if the similarity ends there. Follow up: I was right. I tried one and McDonald's couldn't have been more blatant if they had named it the Mc-Fil-A. It's reasonably good, but it's still not a Chick-Fil-A. If it stays on McDonald's menu then I may buy it whenever I find myself at McDonald's (if there is no Chick-Fil-A nearby). WB is right Michael, apparently you don't have too many Chick-Fil-A's out in Cali. 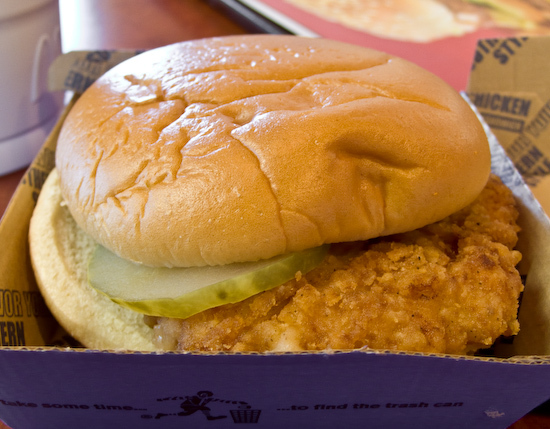 They have been serving the perfect chicken sandwich with just the two pickles for ever. I personally prefer some Texas Pete's hot sauce as an accompaniment. I've never been to a Chick-Fil-A (in fact, I don't think I've ever seen one), but the next time I spot one, I'll definitely go in to see what their sandwich tastes like! Yeah, had this tonight with friends. One of the friends is a Texas expat in exile to Cali and was kicking herself for not ordering it. We had to go back. Having waitressed in the Deep South (South Carolina), and learning to make "real" sweet tea - the way it was made there was to make a sugar syrup by boiling water and dissolving sugar into it until it couldn't take anymore - then adding that to the hot tea that was brewed (not instant powder, ever). The proportions are incredible - especially to any diabetics out there. I think it was several cups of sugar to a couple of cups of boiling water, and that concoction to a gallon of brewed tea. 2 cups of sugar would be more reasonable I suppose. Well… I live in Missouri, and here's how I make my sweet tea (comparable to McDonalds). Place all 12 tea bags into a 4 to 6 cup measuring cup. Boil enough water to fill the measuring cup. Pour the boiling water over the tea bags and baking soda, cover and let steep for 15 minutes. Take out the tea bags (do not squeeze them). Add the sugar to the hot tea. Pour the tea syrup into a gallon container. Fill up the rest of the container with luke-warm or room-temperature water (prevents clouding). Chill and enjoy over a lot of ice. I just had this Mickey D's sandwich last night. I really do love Chick-Fil-A. In fact I was in Atlanta a couple of years ago just for the weekend and we went to Chick-Fil-A 4 times. The closest full fledge Chick restaurant is about 2 hours away. There is a kiosk at a university in the city I live in - they have a limited menu, about 4-5 items. The Mickey D's sandwich was ok - but I don't know maybe it was crispier or something - def. not enough of the seasonings, and smaller. Plus it was 2.99 just for the sandwich. I cannot remember the price at the university - but I will still go to the university to get my fix. I have to drive into a maize like area, park, get out and walk to the student center. But compared to this sandwich I will do it. Plus if I am at Mickey D's my fave is the fish sandwich which is less.